On this level, to achieve all of the Gold Skulls, you will more than likely need more than 1 playthrough. This guide should help you take care of at least the time challenge skull and not losing a unit. The Oni skull is then down to a bit of luck and good judgement. Although this level can throw up some surprises, with the enemy general sometimes even awakening on the first enemy turn, you will always find the same advantage with this starting position. Move your cavalry to the bottom salamander shrine and to the fos shrine in the middle. Move an archer upwards to the further rice paddy he can reach and another to the furthest lower rice paddy. Move an infantryman towards the bottom as well. It is almost certain that the enemy will focus his forces down at the bottom, but he will still send at least one cavalryman upwards to one of the fields. Use your uppermost cavalry and archer to defeat this enemy. At the bottom of the map, what to do will depend upon how the enemy has moved. Chances are he is going to have 2 archers in range on his next turn, which will be deadly, so consider withdrawing the cavalry, archer and salamander monk if you’re going for the first Gold Skull. If not, just rush the archers with the cavalry and finish one with the archer, then hit the other with the salamander monk to drop him to 1 damage. You may even find your kamikaze cavalry is ignored on the next turn because the AI will be desperate to grab the summoning shrine (having missed out on the top one.) Withdraw the fox monk and haunt a field if threatened and you have moves left. If the enemy archers took the bait and followed your men towards the bottom left shrine, kill one and at least damage the other with your salamander. If you took the option to rush, you will have to play it by ear from here, but don’t let the enemy claim the summoning shrine and use your units up top to claim fields and both salamander and summoning shrine. By now, the enemy general is always awake. Draw him into the centre so that you can bring both archers and both salamanders to bear. He will only have a couple of infantry left by now at most and the combination of ranged attacks you have can be lethal in a single turn. 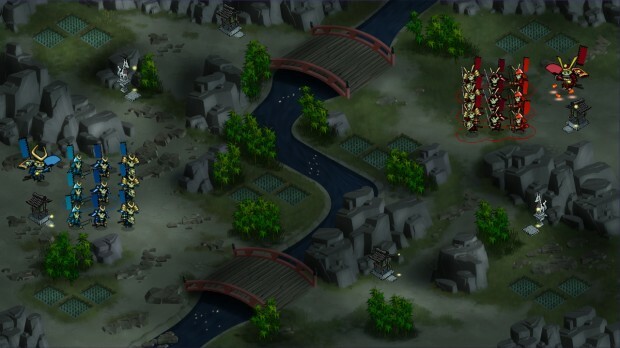 If you find the enemy general is on his own or relatively far from your own units, feel free to go for the Oni kill Gold Skull, but beware that Oni will attack your units as well if left close. This is fairly easy to achieve on this level. Just take it steady and keep withdrawing from the enemy archers. Use the summon shrines to bait them in as the enemy general will be a bit antsy if he does not hold one. This one is easy, but not so much when you are aiming for either of the other Skulls. Just have a salamander monk eat a skull and then cast the Oni on the general. Do some damage beforehand and it should go well, but keep your own units well out of the way. Although it sounds tough, this is the easiest Skull on this level. Do as the guide says to cut off both summoning shrines and the enemy general will be activated quickly. With 2 salamanders and 2 archers in play, you can take him out easily. 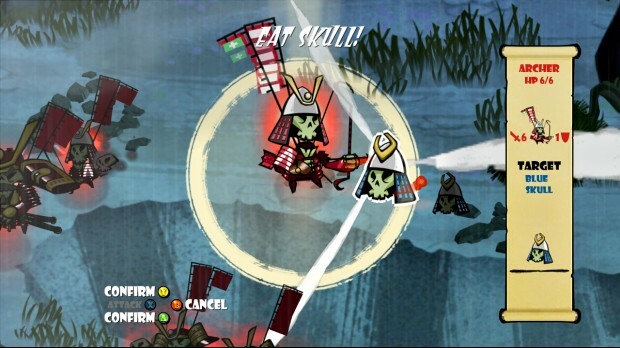 Use a cavalry unit to knock the closest enemy ‘bait’ into the water, then withdraw just behind the log (left side) and then use Akamura to eat the skull. At the furthest tip of his movement range, your archer can hit the enemy cavalry – do so. The enemy cavalry has likely killed himself attacking you, but if not just finish him and move the unit (cavalry I guess) across to the other side behind the other log. Hit the infantry with the archer, then move across if you can, same with Akamura to finish the infantry. You should just have 1 unit of cavalry on the left side, try reach the salamander shrine and haunt it. The last thing to do here is get Akamura a second skull, but ALWAYS eat the third with the salamander monk so that he can cast the Oni spell, rather than turning Akamura into a demon. Cross the bridge. You should now be in the next area, where Akamura tries (and fails) to sneak up on an enemy force. There is a Gold Skull to be had here, which is for killing ALL enemies in this area with Oni. 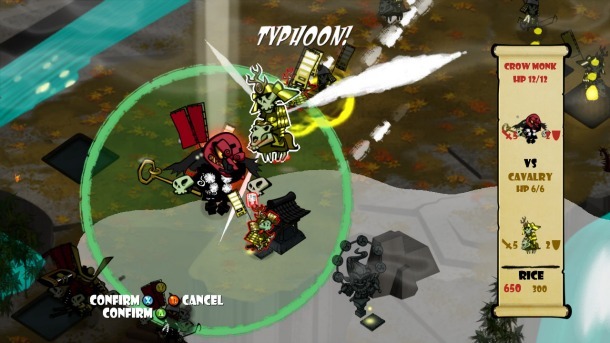 What this actually means is that Oni are the only unit that can DAMAGE the enemy – as we found out the hard way. So, edge the salamander monk towards the left and down and keep trying to use the Oni spell until you’re in range. Cast it at the enemy closest to your force, as they will only keep coming round anyway, so the Oni will basically be ‘in the middle.’ Then withdraw the salamander and everything else back to the furthest away they can go – back over the bridge. Before you go, you’ll notice a health potion in the reeds to the right, so grab it. You can capture the rice if you like, but leaving it actually distracts the enemy force. Keep casting Oni (you’ll need at least 3 and 1 or 2 will probably die as well) and keep your forces back as best you can – remember the salamander shrine will heal 2 hp per turn. Hopefully, you will be able to manouvere around the Oni and enemies and keep Akamura alive – although you may lose a unit or two doing so. Once all the enemies are dead, the Oni dissapear. Collect skulls and demon up as many troops as you can before moving on. When you begin this section, you will be aiming to knock at least 5-6 enemies off ledges and damage Kurokawa (the blue general) but of course, you’ll have 2-3 troops who are in demon mode to help you. Send a cavalryman to claim the summon shrine near you, then back him up with at least 2 ranged units (archers rather than salamander if possible.) Send the salamander and 1-2 other units (including 1 demon if possible) towards the bottom path. Keep an eye on what enemies move where. You’ll usually find at least one or two infantry move up the top path on their own and can easily be killed by your ranged units without exposure to the blue archers. Once the enemy sends a salamander monk or archer, use the waiting cavalry to charge him and if possible, go for the knockback off the edge. If not, put the cavalry in cover and hit him with a ranged unit. On the bottom path, chances are the enemy will have gone for the rice/fox shrine which makes them difficult to reach in a single move from breaking cover. You can use an Oni if you like, or if the cavalry can reach then go for it. Once you control both bridges, you should have no problem weathering the enemies drip fed attack. To damage Kurokawa, our favoured approach is to have a salamander monk in demon mode approach the edge (in front of the enemy archers) and use his area attack spell to damage all in range – including Kurokawa. There is no trick to this one, just knock off the 2-3 guys on the ledge near the start (2 is easy, 3 isn’t) and then finish the rest off when on the final stage. It’s usually quite easy and actually, it’s a sound trick anyway because leaving enemies alive is likely to get your guys killed. This is explained in the guide, but is by no means easy. You might need to try a few times as chance plays a big factor. During the earliest stages of this map, there is no obvious advantage to be had by doing things in a very specific way, but there is an approach which will give you a slight edge. On the first turn, send at least one cavalryman to the nearest salamander shrine and an archer straight towards the rice paddies beside the river (even though he won’t reach them this turn.) Send one or two more units upwards, capturing the fox shrine and maybe one of the rice paddies in the top left corner. Send the salamander monk and the archer (who you moved last turn) towards the riverbank paddies and depending what’s happening and if they can reach, try to attack whatever enemy unit is capturing the salamander shrine across the water. With both units, you may even make the kill. If so, or if you kill the enemy salamander monk on the following turn(s) then the enemy will fairly religiously try to reclaim that shrine – and you will fairly religiously be able to kill the unit being used to capture. In between at some point, you will more than likely get chance to capture the rice fields too! Having digressed a little, let’s get back to Round 2 – send the cavalryman from the salamander shrine south with the intention of taking the summoning shrine on the next turn. Consider sending a remaining cavalry unit from its starting position to the rice directly below, with a view to supporting the other cavalryman you just moved. Capture ride paddies up top if you have the moves left. On this turn, you should be able to move the bottom cavalryman onto the shrine unopposed (although you may be attacked next turn) and bring the other cavalry down to support him on the following turn. Up top, keep capturing rice fields if there are no enemies crossing the bridge and don’t forget the shrine as it will still be key to your defence. At least one (and preferrably two) archers up here are useful, so bear that in mind for later. Do what you need to do in the middle with any turns you have left – now may be a good time to capture the rice fields so that your defenders get +2 hp whilst they wait. The enemy cavalry (which is likely hovering around near the bottom right shrines/paddies will probably have attacked your cavalry on the last turn, but with his health back up because of where he is standing and the other cavalryman moving into range, the enemy should be easy meat. You now control a vital foothold on the enemy side of the bridge, although it will be too late to capture much rice in the following turns. The main enemy force is likely to be moving over the northern bridge by now, but if you have 1-2 cavalry, 1-2 archers and maybe an infantryman up there, you should already be picking them off no problem. Move your southern cavalry around the rocky outcrop to capture any rice left or the fox shrine if they can reach. If the fox monk is around, you can kill him, but there isn’t much point and if you can’t reach anything – don’t forget to eat the skull which will be lying about. Up top, the enemy will certainly be over the bridge in small numbers now, although you may already have killed 2-3 of them. Continue to allow the enemy to throw himself at you on the top side of the map. Keep hammering his reinforcements in the middle with your salamander/archer combo until the enemy stops trying, then move this lethal combo around the top. From the bottom, your fox monk/shrine foothold should give you a strong chance of building a small infantry army which will disrupt the enemy flow. Now just look out for opportunities to get the Gold Skulls and wait for the enemy general to run out of rice and units – which usually happens no later than about round 8-10. This is the easiest and most likely Gold Skull you’ll get. Just wait until the enemy general awakens and pull your force back a little – meet him with your Akamura and you know what happens then! This one depends on the random nature of this level’s weird effect and is totally random unless you use the salamander monk ability to influence it. Just cast the spell (after the monk has eaten 2 skulls) and hope a weakened enemy attacks you. Not fun, we know. This one is easy. The fox monk up top and any salamander monk who follows him up there will have more or less unlimited skulls to pick at, so just do what you do! On this level, you’re going to have to use your initiative and you physically cannot get all of the Gold Skulls in one playthrough, so choose whether you want to kill Oni, or avoid them at the start of your first effort. This guide will be written as though you were going to activate Oni, which basically means you will get hurt, so assume this is the playthrough in which you will kill 5. Send one cavalry as far up the left staircase and the other to claim the fox shrine. Send both archers and 1 infantryman up the right hand stairs. On the next turn, take note of the 4 caves across the level. The first is right behind the salamander shrine on the left side, then there are 2 in the middle behind all the skulls and one more on the right hand side up in the furthest corner. When using your cavalry on the left hand side to take the salamander shrine, be careful not to move beyond it – even if your unit doesn’t end its turn there. Those caves contain Oni! Bring your second infantryman up the stairs on the right in support of the rest and bring the fox monk and cavalry back round to hang on the stairs. Yep, you’re not doing much this turn. The enemy will likely come down both sets of stairs tentatively. If they come down the left, retreat the salamander back towards Akamura, and then use the left side cavalry to awaken the Oni by sweeping him past his cave (you’ll see eyes light up) and then retreat down the stairs. Hold everyone else on the right stairs, or even pull them further back if it looks like an archer might threaten them. Chances are that after your last turn, the enemy came down the stairs, then the Oni came and attacked them. 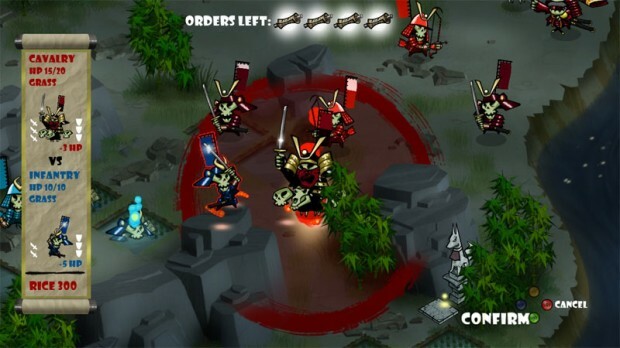 Other enemies will probably have come down the right side as well and if they go into the middle, more Oni will appear. You can just hang back. Take potshots with archers and the salamander when you can, prioritising enemies over Oni because the enemy will only use a certain amount of troops before he holds position at the very top. Once this happens and the enemy are clear, kill any Oni and note how many there were. Now check how things look – you need to get the central salamander shrine, which can be done without awakening an Oni, if careful. You can’t get the skulls or central rice paddies without awakening Oni, but you can get the paddies and shrine on the right. If skulls have dropped conveniently from enemies then by all means eat them and make a demon unit or two. Now draw out Oni 1 at a time from either of the left or right side and pick them off with ranged attacks, closing only when you need to. Once you have killed 5, stop because that’ll be the Gold Skull in the bag. Now head up the (most likely) right hand staircase taking Akamura with you. Use whatever combination of units you have to take out any enemies in the way and go straight for the general. Make the kill with your own and you’ll have the second Gold Skull. The only way to get the third is to let the enemy come down the steps, drawing them out as described above to be killed by Oni and then instead of engaging – just wait until all enemy units are dead and hope you can take out the Oni with ranged attacks only. Remember that if your melee unit can kill an Oni without a counterattack, then it will count as not taking damage – but counterattacks DO count.